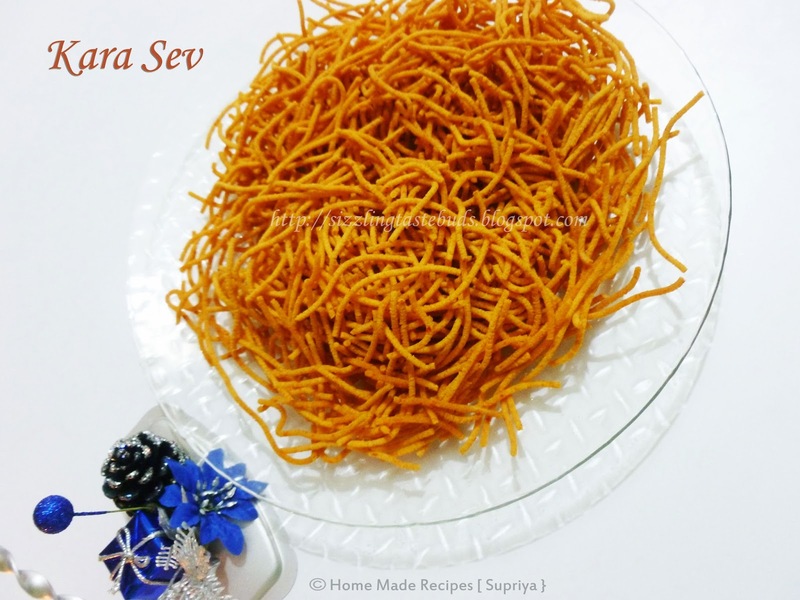 You will find this Kara Sev in shops with a soft texture too. Today I am posting the recipe of Kara Sev which is crispy and yummy. 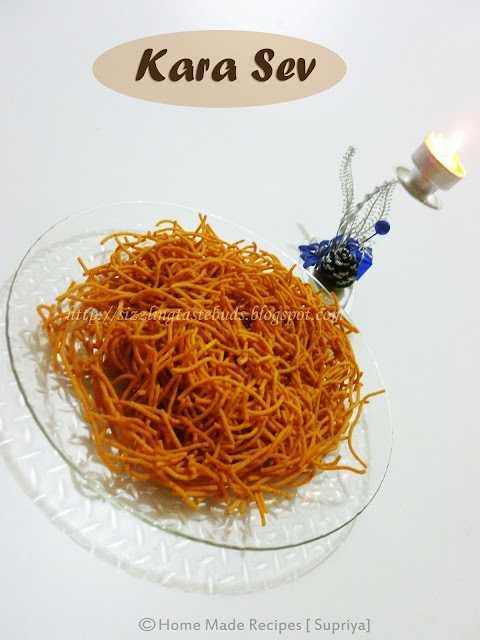 1.Take all the ingredients mentioned above in a mixing bowl except oil for deep frying and mix all together by adding water little by little to form a soft dough. Don't make the dough stiff as it will be difficult to press in a murukku/ chakkali presser. 2. Grease the chakkali presser and fill it with this prepared dough. 3.Once the oil is hot enough, press the presser in circles dropping the dough into noodles shapes in hot oil. Turn it over and cook on both sides evenly. Fry it in a medium flame till it turns golden brown and crisp. Remove it from oil and place it on a tissue paper. 4. Store it in an air tight container when its cooled completely. Notes: Sprinkle little water and knead it again if you find the dough too dry and difficult to press. Murukku/ Chakkali presser comes with different hole plates. You can choose any one you like. I used the thin one here. Yummy. Karasev looks very crunchy.